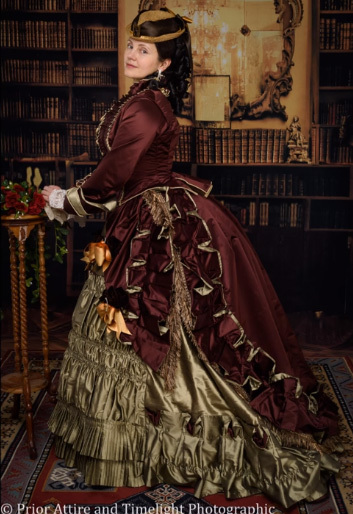 The visiting outfits of Victorian ladies were fancy and opulent. A lot of decorative elements and trimmings were used to adorn the dresses. 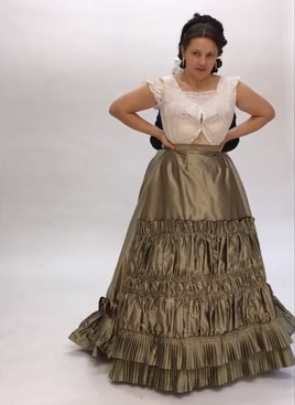 Today, we’ll look at a modern dress made in Victorian style. 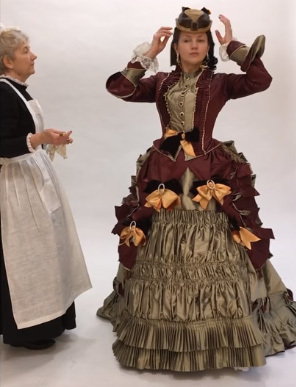 Such clothing was worn in 1868-1872. This particular attire is a replica of the dress made by a French fashion designer Emile Pingat. This is a replica of the Emile Pingat gown, 1872, transitional fashion. Let us see what’s underneath. As always, a chemise, stockings and split drawers are our base. Corset next! Proper lacing, not too tight and not too loose, is the key to comfort on a long day. It is easier to regulate the lacing if you cross the laces at the back and tie in front. Often corsets had a hook in front that helped to keep lacing a bit below the waist. Next, the crinolette. 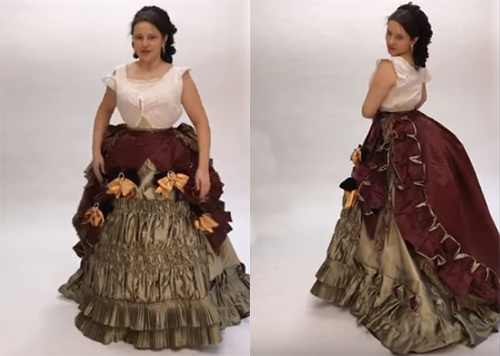 They were a cross between a crinoline and a bustle cage. 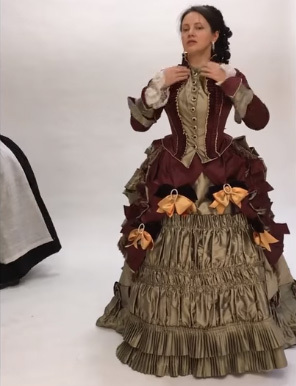 They kept the skirts wide but with the bustle emphasis on the back. The skirt has boning at the bottom and at the back. Petticoat next. One, two, or more were worn, depending on the season and the outer gown/skirt’s fabric. Camisole protects the gown from the corset but also conceals the shape of the corset ridges. In winter, flannel ones kept a woman warm. Time for the skirt. 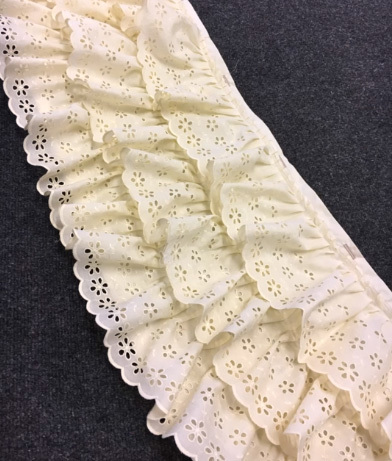 And a glimpse of the balayeuse (dust ruffle) – a detachable, washable ruffle that protected the skirts from the dirt on the ground. This skirt is in silk, with a double row of pleats, a ruched panel in the front, and a complex ruffle at the back. It also has a pocket. Many skirts at that time had small pockets at the waist or side seams. Next, overskirt in silk satin is worn. It has ruffle, fringe, and bows. 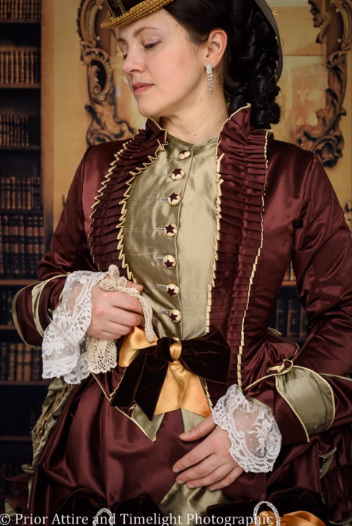 And a bodice in silk, with ruffle, a bow, and complex cuffs. A waist stay was fastened first, then the buttons. 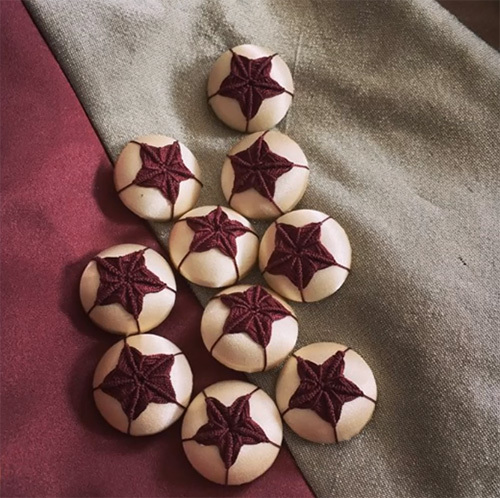 The stay takes some tension from the buttons and ensures the correct position of the bodice. It wouldn’t be the same without the bow in the front. The hat is next. Hat pins secure the hat to a hairpiece. The last thing is the gloves. Oh, and the fan, just in case it is warm. And the woman is ready for some posh visiting. 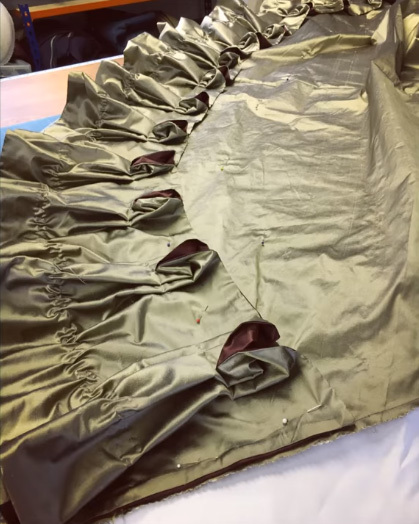 Close-up of the skirt pleats. The balayeuse – rows of cotton lace that button up to trains, skirts, etc. Fully washable.